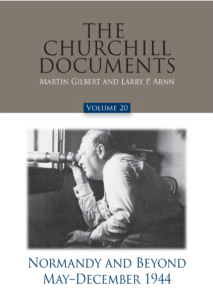 The Churchill Documents, Volume 20, Normandy and Beyond, May-December 1944, edited by Martin Gilbert and Larry P. Arnn. Hillsdale, Mich.: Hillsdale College Press, 2018, 2598 pages, $60. With the publication of this massive volume of outstanding interest, Normandy and Beyond takes us almost to the end of the Second World War. So it is a good time to take stock and retrace the history of this extraordinary enterprise under the general title, Winston S. Churchill. If there ever was a long-haul publishing undertaking, it is what is commonly called the “Official Biography.” Technically there is nothing official about it, except that it was sanctioned by Sir Winston and his family. Many present-day readers must in fact have been born after the first volume appeared, in 1966, over fifty years ago. The genesis and development of the enterprise is summarized on this site. 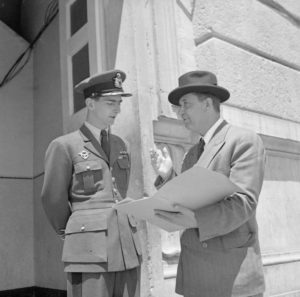 In May 1960, Churchill appointed his son Randolph as his biographer, giving him access to all his archives and papers. Randolph immediately started to gather material, interviewing a number of important people while they were still alive and recruiting a team of assistants. In October 1962 he added a young historian, Martin Gilbert. Churchill died in January 1965. A year later Randolph published the first volume, subtitled Youth 1874-1900. What made matters complicated is that Randolph decided to accompany each biographic volume with collections of supporting documents, which he called “Companions.” Thus Volume I was complemented in 1967 by two Companions: Part One covering 1874-96 and Part Two 1896-1900. Before he died in June 1968, Randolph was able to put together the second biographic volume, Young Statesman 1901-1914 and its three Companions (1901-07, 1907-11, 1911-14). In October 1968, the continuation was entrusted to Martin Gilbert, who assiduously produced six more volumes of biography (for a total of eight, completed in 1988) and eight more Companions. The eighth, published 1982, treated the period from 1936 to September 1939. Companions covering the crucial war years were left pending, in fact because the publishers considered that they were not an economic proposition. Gilbert had of course accumulated the necessary documents and was in no way responsible for this sudden interruption of the project. The financial impasse was solved for a time by Wendy Reves, the wealthy widow of Churchill’s former literary agent Emery Reves. 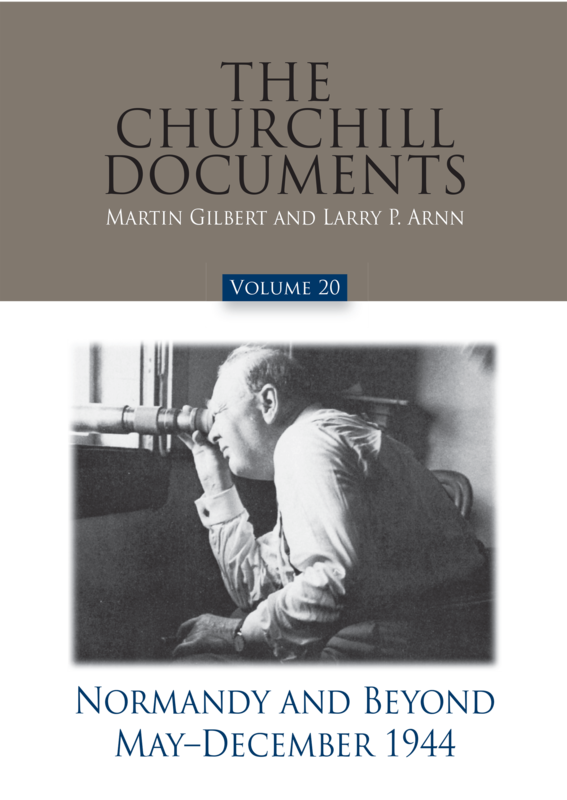 Responding to an appeal by the International Churchill Society, Mrs. Reves donated funds which made it possible to publish three Companions to Volume VI (1939-41), entitled The Churchill War Papers. But the Companions to volumes VII (1941-45) and VIII (1945-65) were still undone. The latest development in this long and complicated story came with the involvement of Hillsdale College, Michigan. In 2002 the College recruited Sir Martin Gilbert as a Fellow. In 2004 Hillsdale announced that it would reprint all the volumes which had appeared so far—Biographic and Companions—and undertake publication of the documents accompanying the last two volumes of text. The clumsy system of naming the document volumes Companions, in two or three parts, was then rationalized. All are now entitled The Churchill Documents, consecutively numbered 1 to 20 for the existing series, with a projected three more to come. A steady flow of heavy tomes followed this most welcome takeover. Now Volume 20, Normandy and Beyond, May-December 1944, takes the Documents to the end of 1944. Sir Martin Gilbert died in 2015, and the editorship is now in the hands of the Hillsdale President Dr. Larry P. Arnn, who had been his chief of research in the 1970s. The title page bears both their names, a tribute to Sir Martin, who had gathered the bulk of the material. 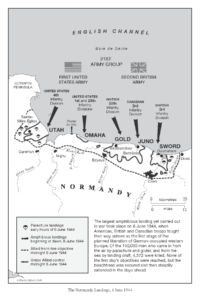 The big affair of the period covered by Normandy and Beyond is of course “the greatest and most decisive single battle of the whole war,” as Churchill termed the invasion of France (with some exaggeration) before the House of Commons on 28 September 1944 (1470). Readers will not be disappointed by the wealth of information—preparations, operations, the difficult “break-out,” the race to the Franco-Belgian and Franco-German frontiers. Thus began the “North-West Europe Campaign,” as it came to be called. Reading the copious documents covering 6 June 1944 and surrounding days, one is struck by the diversity of the fronts with which Churchill, his aides and War Cabinet, had to deal. They faced not only the military point of view—evidently a crucial preoccupation—but also the all-important politico-diplomatic considerations, which weighed on British decision-makers with an eye on the postwar settlement. As a “case study” I picked out the documents running from 30 May— a week before the D-Day landings—to 11 June, the day before Churchill himself visited Normandy. This encompassed less than a fortnight; yet no fewer than 145 pages, ten pages per day, are devoted to these momentous hours. In Road to Victory Gilbert wrote: “At Churchill’s suggestion to the War Cabinet, de Gaulle was to be told about D-Day by Churchill personally, on June 4.” (War Cabinet No.70 of 1944. 31 May 1944. Confidential Annex: Cabinet papers, 65/46, page 786.) In Normandy and Beyond, that top secret Confidential Annex is presented in full (329-30). It offers a fascinating discussion between Churchill and Eden, who disagreed over the role de Gaulle would be allowed to play in the liberation of France. Road to Victory continues: “‘Otherwise,’ Churchill explained to Roosevelt, ‘it may become a great insult to France.’” Now, in Normandy and Beyond, Churchill’s telegram is reproduced in full—not only his warning about an “insult,” but his other arguments. The Queen of Holland and King of Denmark were being allowed to broadcast to their people. 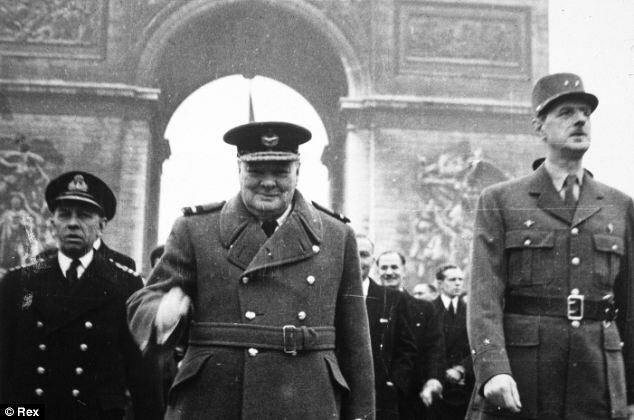 Stopping de Gaulle, Churchill wrote, “would be to destroy the confusing effect we wish to establish by leaving one gap.” General Eisenhower was in agreement (345). Road to Victory concludes the episode with Churchill’s observation that de Gaulle “would almost certainly regard a refusal of this request as an insult and an aspersion on his honour.” An accompanying footnote cites: “Staff Conference, Chiefs of Staff Committee No.163 (Operations) of 1944, 18 May 1944: Cabinet papers, 79/84.” Normandy and Beyond provides the lengthy top secret minutes of the entire meeting (184-89). Entitled “‘Overlord’ Security: Communication of Information to the French,” they are of considerable interest for three reasons. The recent French decision to rename the French Committee of National Liberation the Provisional Government of France was not likely to be well received by the President or the State Department and might further complicate our relations with General de Gaulle (184). Britain’s Foreign Secretary concurred: “Mr. Eden agreed that it was essential that we should keep in step with the Americans in our relations with the French authorities” (185). Sir Alan Brooke was strongly of opinion that General de Gaulle should not be invited to this country until after D Day […] We did not know to what extent the underground organisations in France were penetrated by the Germans and it would certainly be dangerous to pass any information regarding future operations to the so-called Army of the Interior…. Bedell Smith added “that the latest reports led the Supreme Commander [Eisenhower] to discount the value of the French underground organizations” (185). The unanimous opposition of the three British Chiefs of Staff was made clear shortly afterwards: “Sir Andrew Cunningham thought we should not invite General de Gaulle before D Day.” … “Sir Charles Portal agreed with these views” (186). Thirdly, the letters published as annexes to the minutes reveal how confused the Free French themselves were over their status and designation. General Koenig, Commander-in-Chief of Free French Forces in Britain, used the offensive phrase “Provisional Government” (16 May letter to Allied Supreme Headquarters, 188). But Pierre Viénot, Free French Ambassador to Britain in 1943-44, studiously avoided it (17 May letter to the Foreign Office (187). This Eden promptly noticed, and pointed out to Churchill (189). Paris, Armistice Day 1944: All was forgiven, apparently. In the following days and weeks, concern over the President’s reaction to any rapprochement with de Gaulle evidently influenced Churchill, who repeatedly proclaimed that given the choice, he would always side with Roosevelt. Much has been made of the words de Gaulle claimed Churchill said to him on 4 June (duly reproduced in Normandy and Beyond): “…each time we must choose between Europe and the open sea, we shall always choose the open sea. Each time I must choose between you and Roosevelt, I shall always choose Roosevelt” (374). One of the outstanding virtues of Normandy and Beyond is that it shows us what Churchill really thought—whether or not he said it in so many words. Of necessity, Road to Victory gives only a brief summary of the conclusions of the top secret War Cabinet meeting of 7 June (798). Normandy and Beyond devotes over six pages to it (Confidential Annex: Cabinet papers, 65/46, 412-18). The one and only topic of that meeting was the attitude to adopt toward de Gaulle and the Free French in liberated France. Included is a long paragraph in which Churchill “reviewed the course of relations with General de Gaulle over recent years,” along with his conclusion: It was “fundamental that in our anxiety to conciliate the General we should take no risks whatever of straining our cordial relations with the President” (415). See also Professor William Morrisey’s explanation of Roosevelt’s towering disdain for de Gaulle. I cannot believe that the President will agree to be associated with any proclamation by the French Committee of National Liberation which appears to recognise it as “the Provisional Government of the French Republic.” Clearly I cannot agree without his permission nor could I agree to my name and influence being used to procure from him a change of attitude which may bring about serious deterioration in our vital relations with the United States” (434). I must know what the President wishes in the matter. I cannot do this behind his back. If he cares more for keeping de Gaulle out of the picture than for getting a guarantee, for what it is worth, from the FCNL [French Committee on National Liberation], I shall be content. But without his assent we really cannot go forward (444). Finally, on June 11th, on the eve of leaving for Normandy, Churchill wrote to Brendan Bracken, his close friend and Minister of Information. Bracken, he wrote, should warn the press against taking de Gaulle’s words at face value. Churchill added: “You should also make it clear that no breach will occur between the President and me on account of anything that de Gaulle may do” (465). The vast documentation in this book confirms that de Gaulle correctly assessed Churchill’s attitude toward any disagreement between de Gaulle and the President. The book also confirms that Churchill was largely isolated in his obdurate pro-Roosevelt stance. The three Chiefs of Staff were indeed on his side, but he had to face the skepticism and even sometimes the implicit criticism of senior War Cabinet figures: Eden, Attlee and Bevin (as reported on pages 413-415, 416 and 417 respectively). 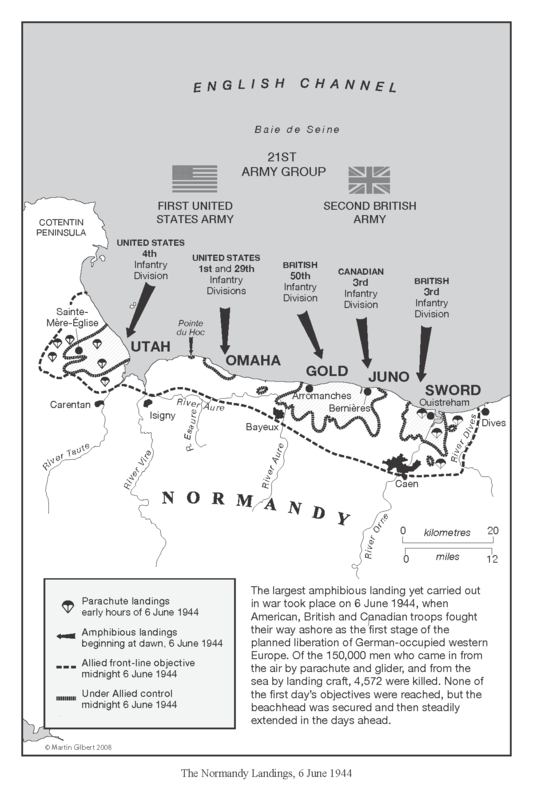 Normandy and Beyond magnificently demonstrates that even in the weeks around D-Day, Churchill devoted enormous time to a myriad of other military and diplomatic problems. He had to assure Belgian leaders in London that he did not put Belgium “in an apparently lower category of Allies than the Netherlands and Norway” (Memorandum, 2 June, 355). He had to convince Stanislaw Mikolajczyk, leader of the “London Poles” (as the Soviets now called them), that the Western Allies would not abandon Poland (Churchill and Mikolajczyk: notes of a conversation. 31 May, 331-34). Churchill’s preoccupation over the restoration of freedom in Greece led to correspondence with his ambassador to Athens on 5 June (379-80), and with Roosevelt on 11 June (459): “The Russians are ready to let us take the lead in the Greek business, which means that EAM [communist-led resistance] and all its malice can be controlled by the national forces in Greece” (459). Next to the relations with de Gaulle, however, it was Tito who most occupied the Prime Minister’s time. From 3 to 11 June, no fewer than fourteen documents deal with this. In Yugoslavia as in Greece, the central question was what role the Resistance would play after the Germans had gone. 1. I do not care how you arrange it, but if Vis were taken and Tito killed or captured, it would be a great disaster which you alone have the Forces to prevent. […] 4. I am still supporting Tito, but as he has come to our sphere of protection on an island [Vis] on which he has no more right to live than King Peter or the Ban of Croatia, it seems that here is the place to try and knock together these Yugoslavian heads and try to get the unity of the country against the Huns, which is our overall objective (439). Normandy and Beyond also contains material of a more personal nature, which ranges from the weighty to the routine. Of some importance was the postwar role of the Duke of Windsor. Among possibilities suggested by his entourage, Churchill preferred “Ambassadorial or Pro-Consular jobs abroad” (30 May 1944, 327). 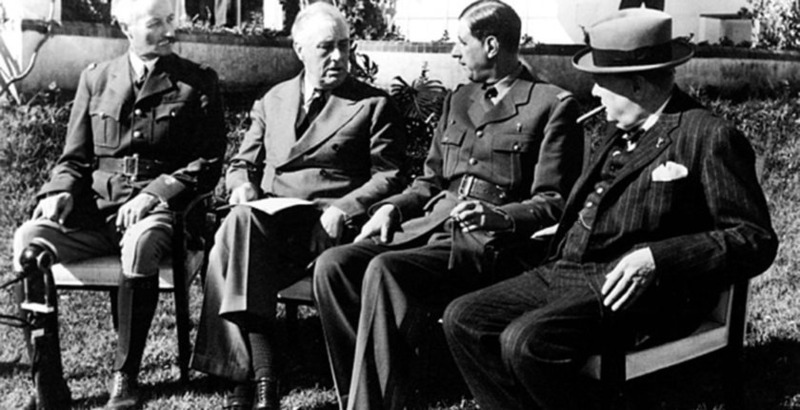 Less crucial, but by no means escaping Churchill’s attention, was a kindness from Roosevelt on 6 June. After hearing that he liked the script they produced, FDR was sending Churchill two electric typewriters, “as a gift from me and as a symbol of the strong bond between the people of America and Great Britain.” A footnote tells us that Churchill found the time to send his thanks on 16 June, but that his secretarial staff did not like them: “One would never be able to type at more than a quarter of one’s normal speed first because the spacing becomes very uneven with any speed at all, and secondly because all the stops and signs are totally different.” To make things worse, a typist continued, knowing Churchill could not bear the clatter of typewriters: “The machine is of course of the ‘Noisy’ variety and would therefore be useless for dictation straight on to the machine” (394). The copious footnoting of this volume continues to meet the very high standards set by Sir Martin Gilbert and Hillsdale’s staff of Churchill Fellows. They were determined to identify every person, place and thing. So does the special map section at the end, and the detailed index. We have several useful Appendices: a list of ministerial appointments from May to December 1944; glossaries of code names and abbreviations (where one will find “EAM” from Churchill’s telegram of 11 June). There are also eighteen pages of correspondence outside the dates covered by Normandy and Beyond. These are between Churchill or his aides and the publisher G. Harrap & Co., which throw light on an important literary matter. Road to Victory mentioned an aborted project—which had led to a 1938 Harrap contract—of a book by Churchill entitled Europe since the Russian Revolution. But it said nothing of the difficulties Churchill had extricating himself from that contract. (Nor do two excellent recent books on Churchill the writer: Peter Clarke’s Mr. Churchill’s Profession and Jonathan Rose’s The Literary Churchill.) Normandy and Beyond fills this void by fully documenting the entire episode (2447-64). For its important additions to our knowledge, Normandy and Beyond will be found essential to anyone writing about Churchill during that crucial period from D-Day to the end of 1944. It will also benefit anyone in search of first-class sources on the Second World War as seen from the Allied side. One cannot wait until Volume 21 appears, completing coverage of the war through the Potsdam Conference and Churchill’s dismissal in the July 1945 election. A review without any trace of criticism would be highly suspect. In this case, however, my only negative comment bears on the type of paper used, which is different from that of previous Hillsdale Press volumes. Its opacity is perfect in spite of its thinness, but it has an unfortunate tendency to wrinkle under the fingers when one turns the pages, and some of the sheets on my copy were slightly crumpled in the printing or binding process. But this is only a technical consideration, and from the editorial point of view one can only end on a note of congratulations to Dr. Arnn and his team. Sir Martin Gilbert would be proud to see their exemplary continuation of his meticulous approach to the greatest undertaking of his lifetime. Evidently, all history departments and university libraries should hasten to acquire Normandy and Beyond. They might even consider acquiring the entire eight volumes of biography and now twenty volumes of documents. Hillsdale College Press offers special reduced rates for the complete series. Even at $60, however, Normandy and Beyond is a bargain, when one bears in mind that many much thinner hardcover scholarly monographs are now priced in the £80-90 range. Unreservedly recommended. Dr. Capet is Professor of British Studies, University of Rouen, France. He is author of a new Dictionnaire Churchill, a major new reference work. This review was first published in Cercles: Revue Pluridisciplinaire du Monde Anglophone, and is published by kind permission of the author.